Home » Analysis & Opinion » Toronto FC vs New York City FC: Will It Be Another Wild One Between TFC and the Pizza Rats? 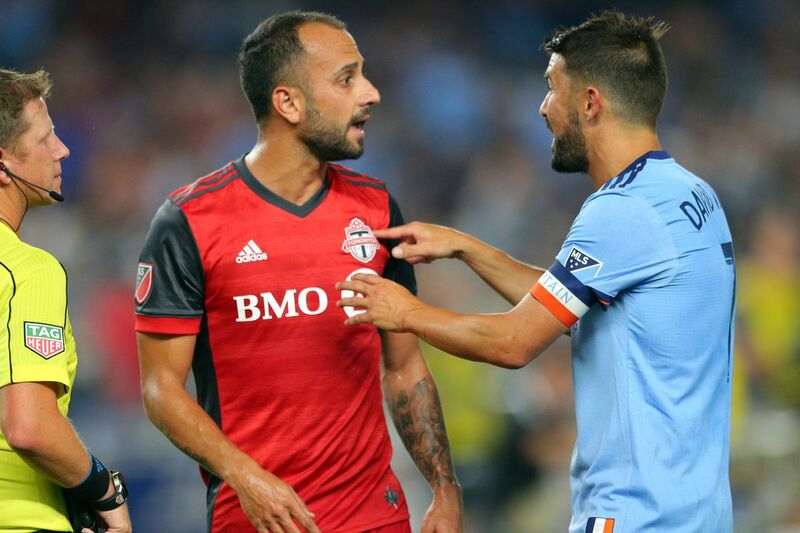 Toronto FC vs New York City FC: Will It Be Another Wild One Between TFC and the Pizza Rats? Who’s ready for some MLS?! Yeah, me neither – wouldn’t it be great if the league took at least the group stage of the World Cup off? Surely the players aren’t excited about having to miss matches for travel, warm-ups and such? Won’t someone please think of the players (and fans)! Sigh… Anyway, this lack of scheduling around the awesomeness that is the World Cup means that TFC have a match today! No really, I checked, totally a legit match. Aren’t you excited about watching Toronto after three thrilling World cup matches? Of course you are. After ten days off, Toronto FC have travelled to New York to take on the pizza rats at historic Yankee Stadium (the house that Villa built), for an Eastern Conference tilt. City lite are currently third in the East, have yet to lose at home, are one of the higher scoring teams in MLS and their defense isn’t too shabby either. Toronto are still languishing near the basement and while yes epic comebacks are both fun and good, that first half in the last match was horrible – TFC still haven’t found their feet this season. Whee, so excited for this game! The exciting part of any match between Toronto and the pizza rats is the possibility (or probability) of a crazy game with lots of goals. Through their short history of competition there have been several wild games, including the completely lop-sided 5-0 win in the 2016 playoffs and last July’s 4-0 drubbing at BMO Field – though it must be noted that TFC have never won at Yankee Stadium in the regular season. Fun. NYCFC have a new coach! With Patrick Vieira having gone off to greener pastures, Domenec Torrent takes the reins for the first time; do teams that are somewhat succeeding still get that new coach bump? David Villa likes to score goals, he almost always scores against Toronto. Don’t let him do that. Sebastian Giovinco needs to start scoring goals, he likes to score against the pizza rats, let’s hope he does that. Chris Mavinga is injured (again, or still injured, or re-injured – I lose track). Better for him to get fully healthy before they start bringing him back again – he’ll be needed to get this team over the hump in the second half of the season. Justin Morrow appears to be back – this is great news, his insertion into the last match (remember that 4-4 silliness? ), had an immediate impact on Toronto’s game. Expect Zavaleta to start, one howler of a half isn’t likely to see him benched (get back up on the horse and all that). Ben Spencer is no longer with the club. I know you’re all saddened by the news but we must move on. Will Jonathan Osorio continue his (team leading) goal scoring ways? It’d be kind of fun if he did – but seriously, Seba needs goals. It’s probably going to be one of those wacky games – teams have had a break, the World Cup is one big distraction noodle, Toronto are still coping with injuries/starting XI cohesion, and the pizza rats have a new coach. Which means this should at least be a fun one to watch. I think I went with a 2-2 prediction on last week’s podcast, and I believe I’ll stick with that. So you’ll have just about an hour between the last World Cup match to switch gears to TFC fan, so get your snacks and drinks sorted and settle in for some bonus footy.